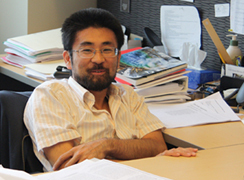 Interviews with Imaging Experts - Takanari Inoue, Ph.D. Please tell us about your research. We are interested in dissecting the spatiotemporal characteristics of intricate signaling network in cells. We are currently focusing on cell migration, a dynamic cellular process that occurs on a timescale of minutes. To investigate the signaling network that drives cell migration, we have recently developed molecular tools for the inducible, quick-onset, and specific perturbation of various types of signaling molecules in the subcellular compartments of single, living cells. (See below for figures, images, movies.) Our goal is to enhance our understanding of the molecular mechanisms that are responsible for cell migration by using these molecular tools together with the fluorescence imaging technique. b) Confocal fluorescence images of HeLa cells showing translocation of cytoplasmic proteins to specific organelles upon addition of a chemical dimerizer (iRap). Scale bar: 20um. The treatment leads to translocation of cytoplasmic proteins to specific organelles such as Golgi, endoplasmic reticulum, lysosome, mitochondria and plasma membrane. What role does live imaging with the CSU play in your research? 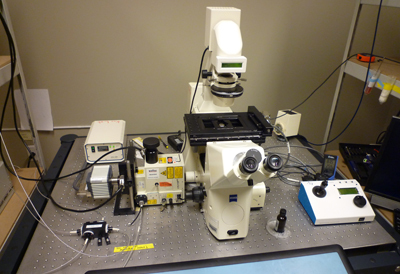 The time-lapse, live-cell confocal fluorescence imaging capabilities of the CSU have been indispensable in quantifying a variety of molecular players with high spatio-temporal resolution at various locations inside living cells. Every day our CSU generates about 5 GB of video data. When did you start using the CSU? It was 2003, when I was starting my postdoctoral research in the Tobias Meyer Lab at Stanford University. The lab had two CSU10 units. That was the first time I came across the CSU. How would you sum up your feelings about the CSU? After using the CSU almost every day for the last six years, I feel as if it has become an extension of my body. What are the good points/bad points about the CSU? Pros: Unrivaled capability of taking fast time-lapse confocal images of living cells. It is unbelievably reliable and robust. We have never experienced a malfunction with it. And most importantly, we have been getting great technical support from Yokogawa. I hope to be able to contribute to science as well as the scientific community by providing knowledge and tools of fine quality. As soon as funds become available, we would like to get another confocal microscope with the latest version of the CSU. My hobbies are playing with my son, traveling to the far corners of this country and the world, and procrastinating on paperwork. Famous for his discoveries in signal transduction including the regulatory mechanism governing potassium ion channels and the membrane targeting mechanisms of small GTPase, Dr. Inoue opened his own lab at Johns Hopkins University in April 2008. It is a great pleasure to know that the CSU10 system has been a key technology in his research and that part of his enormous collection of live cell imaging data has appeared in the latest edition of Nature Methods. Note: “Perspectives” (Science 314, 1402-1403 (2006)), “Editor’s Choice”(Science STKE 364, tw410 (2006)), “Spotlight” (ACS Chem. Biol. 1, 608 (2006)), “Research Highlights” (Nature Methods 4, 7 (2007)) and “Review” (invited by Nature Chem. Biol.). Note: “Research Roundup” (J. Cell Biol. 177 (6), (2007)). Yogo T., Urano Y., Mizushima A., Sunahara H., Inoue T., Hirose K., Iino M., Kikuchi K. and Nagano T., Proc. Natl. Acad. Sci., 105, 28-32 (2008) "Selective photoinactivation of protein function through environment-sensitive switching of singlet oxygen generation by photosensitizer"
Fivaz M., Bandara S., Inoue T. and Meyer T., Current Biology 18, 44-50 (2008), "Robust neuronal symmetry breaking by Ras-triggered local positive feedback"
Rahdar M., Inoue T., Meyer T., Zhang J., Vazquez F., Devreotes PN. Proc. Natl. Acad. Sci.U S A. (2009) “A phosphorylation-dependent intramolecular interaction regulates the membrane association and activity of the tumor suppressor PTEN” 106(2):480-5.